My Reader's Diary reviews are certainly not an indept study of any of these works. They are just my impressions as I make my way through the books. My next one will be of Spenser's The Faerie Queen which I am purposing to read during the month of November. I should preface this particular diary by saying that I loathe Charles Dickens. I think he's long winded and boring. My husband, on the other hand, seemed to enjoy his works growing up and it was at Jonathan's encouragement that I try reading A Tale of Two Cities. I didn't get very far before I remembered why I didn't like Dickens. Then last Christmas I decided I really should read A Christmas Carol because, well, I should. I did. And I liked it. Seeing that it was a short story, there was less time for Dickens to be so very verbose (like I'm being now). 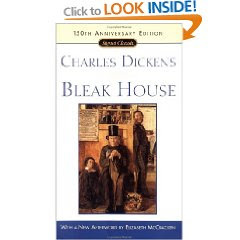 Sooooooo then my friend Calon Lan read Bleak House and liked it. (She had heretofore not enjoyed Dickens much either.) And then my friend Mirlandra watched the mini series of Bleak House and assured me with all that was in her that I had to enjoy it. (I'm pretty sure it was a "You WILL enjoy this" type of recommendation which is hardly convincing yet still compelling. I have my doubts but decided to go ahead and give it ago. My companion on this self-inflicted journey is Sarah from Library Hospital who agreed it would be fun to read it with me. THAT, my friends, is how this came to be. DAY ONE: Chapters 1-3. Usually I take some time easing into big books so I didn't set out to read very much today. After my experience reading Wives and Daughters I expected to muddle my way into Bleak House. But not so. Surprisingly (to me anyway) Dickens has apparently lept right into this story and has introduced me to Esther which I liked on the spot. I'm not sure if she's the main character but I'm hoping so. If she is, I might just like this book after all. DICKENS! Who'da thunk it? DAY TWO (of reading): Chapters 4-5 I took a few days break because of out-of-town company and came back to read only two chapters. Should not have taken a break. I was totally lost. Apparently Dickens is not one of those authors that you have the option of stepping away from at your leisure. I think once you get into it, you have to be into it for the long haul. And it's a long haul. Sigh. "There were the Women of England, the Daughters of Britain, the Sisters of all the cardinal virtues separately, the Females of America, the Ladies of a hundred denominations. They appeared to be always excited about canvassing and electing." It is funny. But overall I find Dickens confusing and, dare I say it?, boring. Esther did get her first proposal and declined in a manner suitable to Elizabeth Bennett. Of course, any man with the last name of Guppy really shouldn't expect a girl to be too excited . . .
DAY FOUR: Chapters 10-11 I am now 160 pages in with 731 more to go. Wikipedia helped a lot to make things more understandable but Dickens is throwing in subplot after subplot, character after character in such a way as to make my head spin. I understand this was a series of articles printed over a course of time when people honestly had little other forms of entertainment available to them. I will readily admit that to tackle Dickens in this day and age is a feat of some magnitude. And I'm here to say - Dickens has won. I'm dead. My husband asked why I was still reading it if I didn't like it. I said it was a matter of pride. He said that was a bad reason. And it is, but I was going to read it in the name of pride anyway. But pride be dashed! I just don't like Dickens. He and I do not get along. I could muddle through 731 more pages but I'm simply not interested. I believe that Sarah at Library Hospital will be the better woman in this case. Stay tuned to her blog for her review. Noooooooooooooooo! I got all excited when I saw your blog post and (I admit, a little jealous. I thought you had finished it and here I am still plugging along...) only to find out you've not even got half way and have quit. Sniff sniff... Oh I wish you hadn't given up. Well stay tuned for my review, I've got 300 pages to go. I can totally understand why you got lost in such a long book. Even if you never give it a shot again, you might find that you enjoy the BBC dvd of Bleak House with Gillian Anderson. It's long, but if you can hang in there a bit, the details do come together to make a very interesting story. I very much enjoyed the movie and was glad I put in the time to finish it. Maybe some day I'll give the book a try, but not without refreshing myself with the movie so I don't get lost in the plot. I think my highly-developed skimming sense helps me get through Dickens. Useful with any nineteenth-century novelist (except Austen, who managed to escape that urge to ramble on endlessly about tangential points). I would try the miniseries, although I haven't watched it. But generally movie adaptations of Dickens are quite good. You get all the great characters and implausible plot constructions without having to wade through all the extraneous stuff. We LOVED the miniseries of Our Mutual Friend. I don't think Dickens won. I think you beat him. Oh, Dickens, how do I love thee? Seriously, though, Oliver Twist was key to me. I laughed so hard, cringed, enjoyed the honest descriptions of life, and cheered for Oliver to make it through it all. Yes, he rambles, but THAT'S WHAT IS SO FUNNY. Okay, you don't have to like him, fine, but I'm excited that I have so many of his books left to read! Nineteenth century literature is by far my favorite. It just clicks with me, somehow. I believe I suggested you AVOID the book and watch the BBC instead. And, I think this is the only book I have ever read where I believe that! I love the rich language of Dickens and would read the entire thing cover to cover just to wallow in his words, but I imagine most people wouldn't care for the book - it is just too long for many modern readers. Esther gets a wonderful ending, by the way, but, props to you for at last having a taste! Dickens was a hack. I agree with you so much: BORING! I did like A Tale of Two Cities, but even a pulp writer can come with an occasional good work. (Enough monkeys at typewriters could produce Shakespeare. )One good book is not at all characteristic of Dickens. Dickens wrote for Victorian England. His chip on the shoulder from his dysfunctional impoverished family is utterly tiresome. I had the unmitigated gall in high school English to pan Great Expectations (an ironic title) and was flunked for the semester. That seemed to prove to me that I was on the mark. I'll stick with Ayn Rand and Plutarch. Even liking Dickens, it took a long while to get into this one. It's not until chapter 16 or so that he begins bringing all the different elements together, and there are some 4 dozen characters. I would have had a hard time reading it because it would have monopolized so much of my reading time, but listening via audiobook helps because then it's enlivening those times where I am doing something with my hands but am free to think abut something else. That would be hard to do at your stage of life with littles around, but maybe someday that might b a good option for you. I haven't seen the miniseries mentioned yet but would like to some day. Dickens does provide a very satisfying ending to most of his books, and this was no exception. I liked where Esther ended up, was saddened at how Lady Dedlock and Richard ended up.